Probably the first in a line of great quarterbacks at the University of Miami was Sam Scarnecchia. 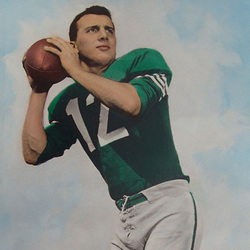 Scarnecchia, a two-year letterwinner at quarterback in 1955 and 1956, showed the grit and determination that it took to be a success on the field and led his teammates to an 8-1-1 record and a then school best ever Number 6 ranking in the final Associated Press poll of 1956. The 8 wins included victories over state rivals Florida and Florida State. Scarnecchia also led the team in scoring in 1956 with 42 points and in passing in 1955 and 1956, combining for 58 completions in 108 attempts (53.7%) for 842 yards and three touchdowns. Although these numbers were impressive in their day, they are even more impressive when you consider that during his senior year in 1956, Sam's quarterbacking statistics were acheived while starting every game as a strong safety as well!